Why is engagement important for online courses, and how can you better engage your students? A high engagement rate is important for your online courses for a number of reasons. Good engagement helps to build a community, ensure student success, can help provide you with testimonials, and reduces your number of refunds. To run a successful online course business, you really need to care about the success of your students. Recent studies have shown that the average completion rate for online courses is just 15%! The study was looking at free online courses, and the figure for paid courses is likely higher than this, however it’s a great reminder of the importance of making sure your students are engaged in your courses. In this article I'll share some ways that you can help maximize student engagement. These methods also apply to membership sites, group coaching and any other kind of online learning. Today's students demand a more engaging learning experience. But the good news is that it's easier than ever to provide them with exactly that. Here are some great ways to keep your students interested and engaged. I don't recommend full-on manual testing where you'll need to spend hours grading your students' work. That isn't an effective use of your time or theirs. But providing simple quizzes and other self assessment opportunities gives your students the ability to take more responsibility for their own learning. Use automated grading or simply have your students honestly assess their own work. You can also have students grade and provide input on each other's work. Or use short non-graded quizzes that don't need any grading at all, but just help students to further internalize the information they've learned. Provides student with immediate verification of whether they're correct or incorrect. Gives feedback to you as an instructor as to the effectiveness of your course. Making quizzes required, but not graded, or required to proceed to the next stage of the course, makes them less intimidating to students. Your class can focus more on using quizzes as an educational tool without the pressure of worrying about their grade. Making learning social can really help to engage students and spice up the learning process. They can be a huge benefit if you use them correctly. This lets students get their foot in the door and they're likely to continue engaging in conversation and being engaged by the course community. At first you may need to create conversations that students are interested in yourself, then you'll see many of them become willing to participate and even starting their own discussions. Consider using Facebook to even further increase engagements. You can create a private group where students can talk to each other on a platform they're likely already quite familiar with. Plus Facebook provides helpful notifications whenever there are replies to their comments. Some students might not think to check your course discussion board, but they're likely already on Facebook and other forms of social media multiple times per day. Or if you don;t want to use Facebook you use a forum on your site or apps like Discourse. Live streaming and live interaction with instructors is something that online course participants are expecting more and more nowadays. Especially if you've got an existing audience or following on a platform like Youtube prior to launching your course. Live streaming can be an awesome way to get people engaged and invested in the course material. It creates a commitment to show up at a specific time and shows they're serious about learning. It can be a great way to clear up common questions for your students, as well as identify trends and patterns in where people might be struggling. For students with other engagements who aren't able to participate live, you can still provide access to pre-recorded Q&A sessions after the fact. Live Q&A sessions have another benefit too. You can repurpose clips from them into videos for your Youtube channel, or as additional modules in your course. Essentially creating twice the content for not much extra work. When most people visualize online learning, they picture people sitting in front of their computers. But it doesn't have to be that way! Encourage your students to get up and involved by using active learning. This can be any type of hands-on activity like going out into their local community. Or working in the field if your course is about outdoor activities like dirt biking, birdwatching, etc. Get your students to go out into the world to gather and analyze. Then ask them to report back and share what they've learned from the community! Discussion boards and email tends to be the usual communication tools that instructors use to stay in touch with their students. But don't be afraid to branch out from there. Consider using instant messaging and chat rooms, home page announcements, broadcast text messaging, and embedded audio and video to further communicate with your students. Screencast videos go over well with students, especially for parts of a course where you need to walk them through a process step by step. They're also quite inexpensive and easy to create. You could even consider running a podcast for your course members to create a more informal channel to discuss things, alongside your core lesson materials. Giving your students feedback about their performance is a really important part of keeping them engaged. You need to respond to emails and questions on your forum in a timely manner, especially if the information is needed to complete the next activity or assignment in the course. If you're grading assignments or quizzes, a quick turnaround time can also have a positive impact on the student's learning. Your student should never need to complete their next assignment until they've received feedback from their previous one. Detailed and positive feedback tends to be more useful than generic praise or messages. People love good stories. It helps them better absorb information when it's presented in a relatable way, or stories that they can imagine having benefit in a real life situation. Stories affect our emotions, which also makes information more likely to be retained. You don't need to have a long narrative. You can simply use examples to help get your point across with much of the same effect. Having a course with huge HD video files to download can be alienating for your students with slower internet connections or who access the course on mobile devices. Try to make your course load as smoothly as possible on a variety of devices and internet speeds. Most online course platforms do a good job of streaming your videos and offering the option to download videos too if you wish. People tend to be more engaged and motivated when they have some input into what they're doing. Give students options when it comes to some of their assignments. Some people might prefer to get their lesson in one format over another. Some may want to just get a surface level understanding of a topic, while others want to really dive in. Using self assessments is another way to let your students control of their learning. If they think the introductory topics are too simple, let them skip over them. Asking your students for feedback can make them feel that their wants and needs are heard. Don't wait until the end of your course to get feedback. You want to be frequently asking for it so you can make adjustments as you go. One easy way to do this is to set up an email sequence that automatically drips out to course members in the weeks after they join your course, supporting alongside the course lessons and asking for feedback and questions on things they're unsure of. Everyone learns differently and absorbs information better through different delivery methods. Visual learners tend to prefer images and pictures. Auditory learners prefer listening to lessons. Verbal learners may prefer words either in writing or speech. Also consider options for both social learners who prefer to work in groups with others, as well as solitary learners who prefer to work alone and rely on self-study. Use a mix of different content delivery methods to appeal to each group. Include a mix of video, audio, text, and presentations. You might even want to bring in a guest speaker just to mix things up so every lesson doesn't feature the same voice and face. To gamify means to apply elements of games to otherwise mundane tasks. You can engage your students by turning learning into a game. Keep track of points and high score, or allow people to gain experience and level up, or even compete against others. Gamifying your online course can be as easy as providing badges and certificates that your students gain as they progress through the course or hit specific milestones. If you want a more in-depth example of gamifying, check out the mobile app Habitica to see what's possible. It can be used to gamify almost any tasks you need to accomplish in life like going to the gym, eating healthy, etc. I think there's even room in the market for an online course that essentially turns the learning experience into an RPG (role-playing game), complete with your own character, experience and level, items, health points, etc. That would be the ultimate version of gamifying your course. For many topics you might want to teach, the information you're providing now might not be relevant in 5 years from now. Constantly updating your content with the latest information is one way to really differentiate your online course from your competition. Share real life examples and case studies, new developments and research, related news stories, emerging trends, and changes in regulations and policies. Having a relevant and timely program makes it more appealing. Plus relating your subject matter to current events will better engage and keep your student's attention. You can use technology to keep your students engaged without any extra effort or followup required on your part. An automated email notification after a student hasn't logged in for a certain number of days or is lagging behind in their work will provide the motivation (and possibly guilt) needed to keep them going and complete the course. Don't just use guilt to keep your students accountable though. Let them know they can do it and they aren't alone. Students can also be accountable to each other or the group. Just like having a gym buddy who makes sure you're regularly exercising, students can use discussion boards to keep each other accountable to the course and their goals. For complicated topics, you might want to consider hiring some of your past students to mentor and coach current students. These mentors can provide advice and help for current students based on their own success and experience. They'll also act as motivation that the course can be completed. Having a team of dedicated mentors is taking your course to the next level, and I doubt your competition is doing anything similar. It adds a lot of value to your course. It might be as simple as asking former students to moderate your discussion board and give helpful replies to current students. So far I've talked a lot about extrinsic motivators that will help keep your students engaged. That's things external to themselves, like accountability, badges, and community support. But it's also important to develop an internal motivation in your students. To be engaged and passionate about a course, your student needs a really strong “why” to keep them going through all of the lessons. Give a motivational speech of all the benefits that your student will have after they've completed your course. If it's a course in teaching guitar, have your students imagine what it will be like to be the one in their friend group who can whip out a guitar and entertain everyone. They'll be able to write love songs for their significant other, express their feelings, and potentially get a career in the music business. If you have a course about entrepreneurship, get your students to imagine how much better their life will be once they implement what they learned in your course. Including no longer having to drive through traffic to work or listen to their boss, and working on their own terms. It's those intrinsic motivations that will keep students going even when the course gets hard, or they need to juggle your online course and their real life responsibilities. Let them know that learning what the course has to offer matters, and will positively impact their lives. Basically, give your students the big picture of why the course is important to them. Proper organization of your course is critical to your student's success. A messy or disorganized layout can be overwhelming and cause your students to give up before they even get started. Give students lessons in short, easy to digest formats that will feel manageable and achievable. You'll need to find the right balance for your course. Breaking your course down into dozens of lessons can be intimidating when your student logs in to a whole page of modules. But having too few sections of your course might make them less manageable. Or even worse, your student will see only four lessons and question whether your course offers enough to be worth the price tag. I'd recommend creating a course outline with at least ten different lessons, but no more than fifty. If you have a complicated topic that needs more than fifty lessons, group them together into different chapters or modules and be sure to give your students a way to check off lessons to keep track of their progress. You might even want to think about splitting your one course into three separate beginner, intermediate, and advanced courses. The same goes for videos. People have short attention spans, so ten minute videos will do much better than hour-long lectures. Your students are busy people just like you. In addition to taking your courses, they probably have full-time jobs, hobbies and social commitments, plus a family to take care of. Nowadays it's important that your students have access to work on your course while they're on the go. Whether that means taking their lunch break to work through one section of your course, or reading part of a lesson while they're waiting for the bus or their child is taking a nap. Make sure your content can be viewed and interacted with on mobile devices like cell phones and tablets. The majority of online course platforms and WordPress plugins will take care of this and already make your course adaptive and responsive on a wide variety of common devices. So there we have it – 17 different ways that you can level up the engagement of your students inside your online course. Keep your course members active and engaged with their learning and they're far more likely to complete all the lessons and apply what they've learnt. 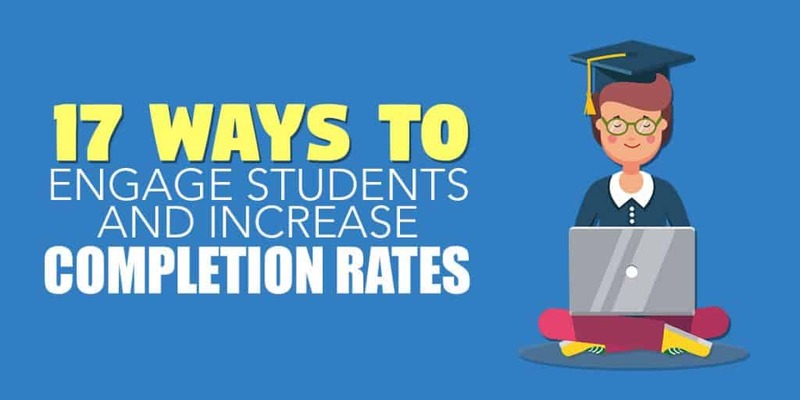 This helps them reach their goals and in return you are more likely to get good testimonials and case studies to show potential students and help you sell more courses!